As I sit here at my desk, peering at my beautiful Apple cinema display, keeping an eye on all the tools that allow me to connect with so many people remotely I am struck with a sense of … loss. I know, to some of my social media “connections” I am just a number in a game called online influence. Equally, I have made some incredible connections online. I have gained enormously from conversations, links and collaboration. These are not just numbers, but relationships. Just like in the “real world” relationships are built through trust, context and the ability to add value through being who you are. How then can we build relationships online when we deal primarily in numbers? How is a social media strategy different from a mass TV or radio campaign if it consists of sending out periodic links on twitter to 20,000 + “followers”? We can argue that it is targeted. We can debate that this is where the target audience are. We can even try to convince ourselves that the 20,000 + profiles have opted in. I am not so sure. Absolutely there are individual instances where there might be opt in, where a personality has something to say that hundreds of thousands of people want to hear, but these are exceptional cases. Here there is already trust and a desire to consume their information and content. These personalities have worked hard to get to where they are. They give of themselves and offer value. Their following has grown organically. As a Zimbabwean I look to the policy of “printing money”. As more and more zeros were added to the Zimbabwean dollar, its actual value, in real terms went down. Now, it has reached the stage where the currency has been abandoned. Zimbabwe has moved onto something new. 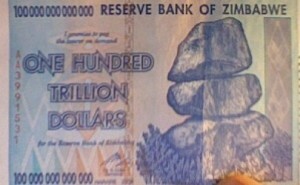 The Zimbabwean dollar is worthless. We talk about social media as being about relationships. We argue that you cannot put a price on true connections and real conversations. The numbers game is the old way of doing things. Perhaps this message has not permeated through? Fascinating points. I made a decision last fall to invest in building a twitter network. Persistence has brought the numbers of that account almost to 20,000. That being said, this is how I look at the issue. For every 1000 reciprocal follows in my account I gain roughly 10 relationships of value. I continue to explore growth so that I can connect with next ten. Richard, you always add value and you work hard at your relationships. Commenting requires generalisations, but as we all know, there are are always exceptions to the rules.